I think I am on a roll, now I don’t think I have done anything Indian of this magnitude all through my blogging or actually in my life. 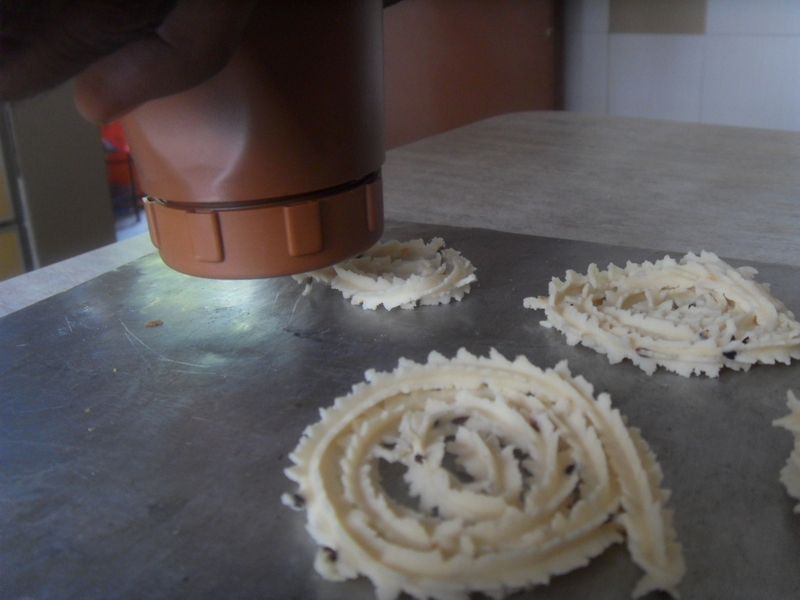 It must be the Diwali Spirit of sorts that’s making me Try out making Murukku, then I had Crocodile Varuvel, and now making Murukku. Even the Indian man at the store who has known me since I was a kid asked me how come I didn’t buy the readymade Murukku like my family usually does and I seem to have carried on that tradition. You know my love for good Murruku goes back a long long way that at Christman my Grandaunty would give me two big milk tins. Everyone got presents and I got two big tins of Murukku. So today is history for me. Ok I cheated, I bought a bag of ready mix Murukku Mix, but truth be told if you followed the directions on the back, 100 percent it would not have worked, so you still needed to learn and watch other people as well as get their advice on certain tips. The recipe says 30 gm of ghee, I added half and half but Butter is good as another Grandaunty of mine Aunty Letchumi used to add in butter into her Murukku and it was till this day remembered as Just Heavenly Divine. Pity none of my aunties ever had picked up her skills. I should ask my Aunties for the mothers recipes and see how it goes. of the day. I used more today despite adding in more butter. grounded as part of the ingredients. 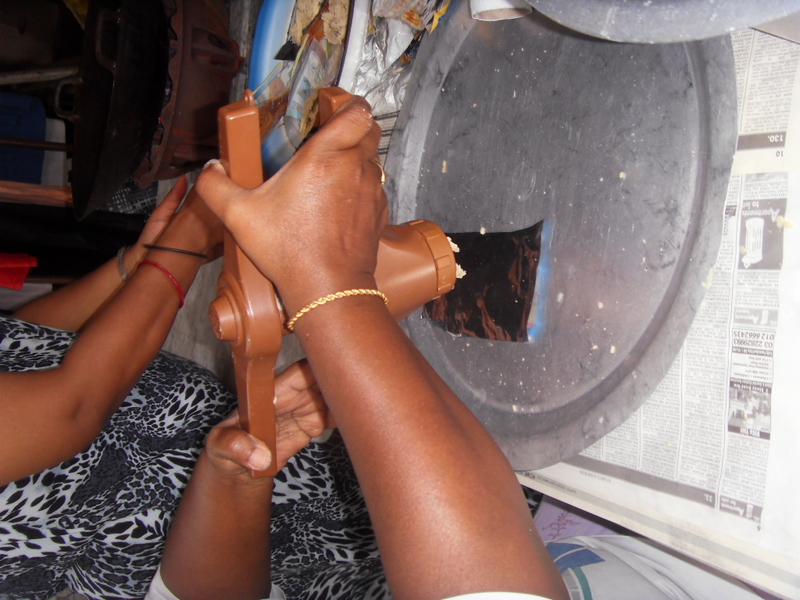 Murukku Press – I have a generic plastic one which believe it or not is still Patent Pending. 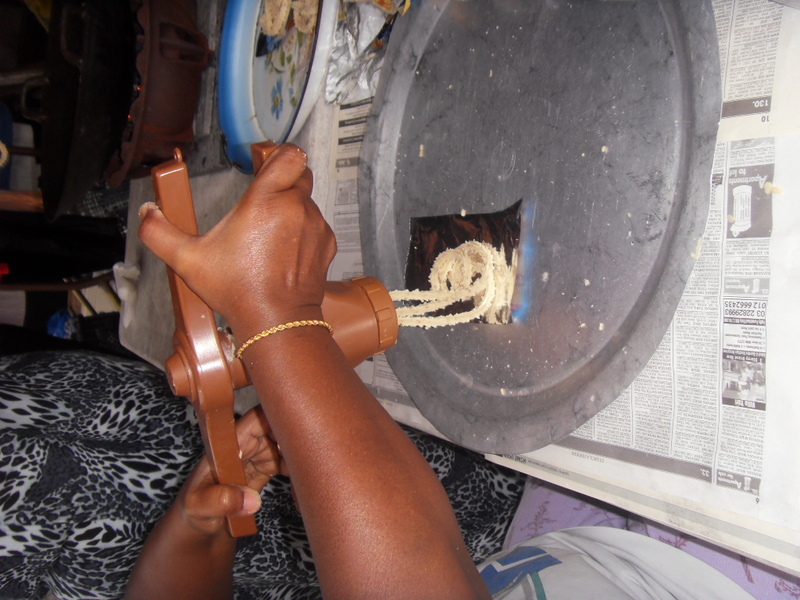 Now this method of preparing the Murukku I learnt from my neighbor Mala. Of course Baba’s does not tell you to do anything of the sort. One would think they produce Murukku and need to hide the right way of preparing the stuff. Going off a tangent here but I think it is damn silly for a company selling a certainfood product and not providing a good and thorough recipe because if I used your product and follow the recipe given and if the food does not come out as shown or even in taste, I would never ever buy your product again. Now a few of the Indian Spice producers, no names mentioned are known for this silliness. It is silly for a producer of ingredients to do this because most novice cooks will use your products and if it spoils they will never ever buy your product and will even go as far as to tell others your products do not work. Hope someone reads this and tells them. 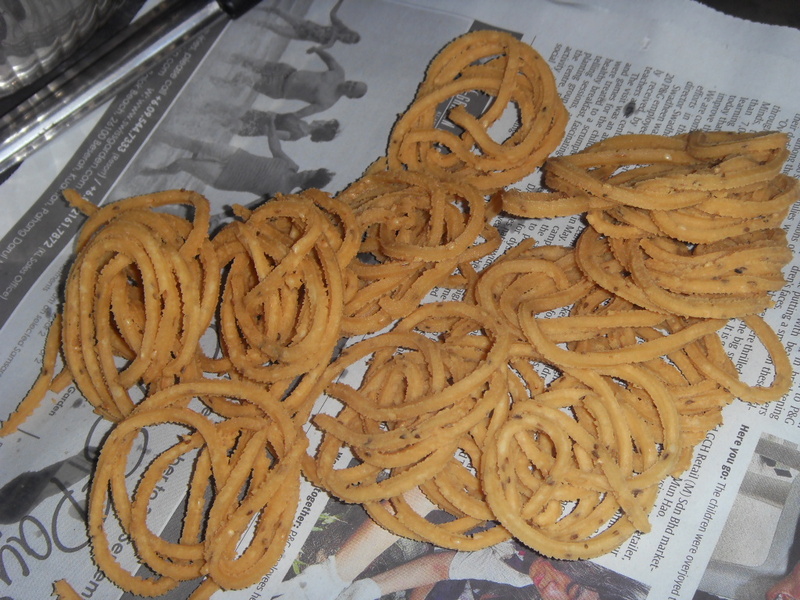 Dry fry the Murukku mix. 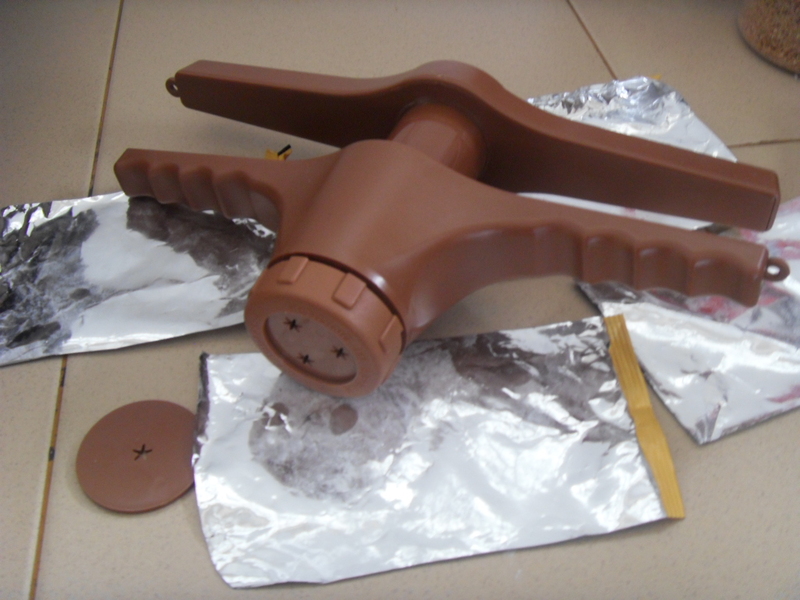 Make sure it does not ever get brown as it will affect the taste almost instantly. Fry it for about 8 to 10 minutes. 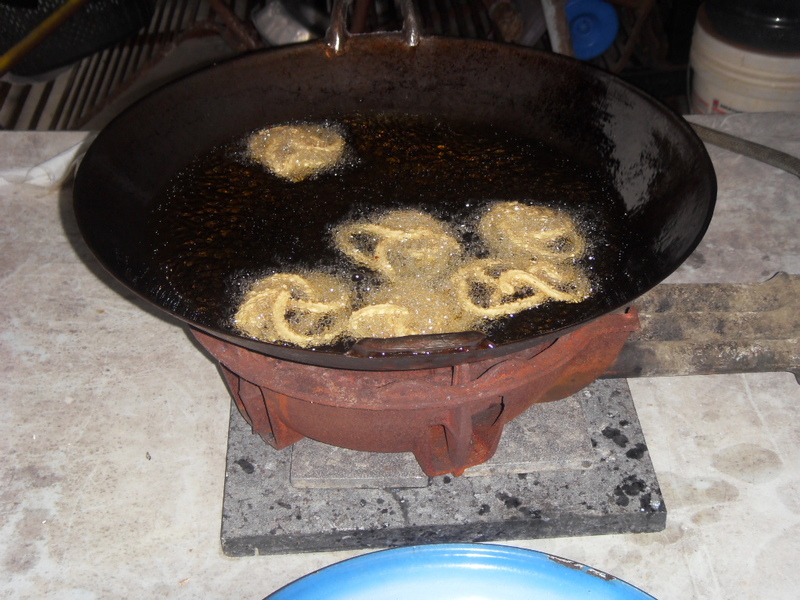 Always Dry Fry on low flame. Dry fry the spices as well till it is fragrant. Mix the flour and the spices and add in salt. Leave it to cool. 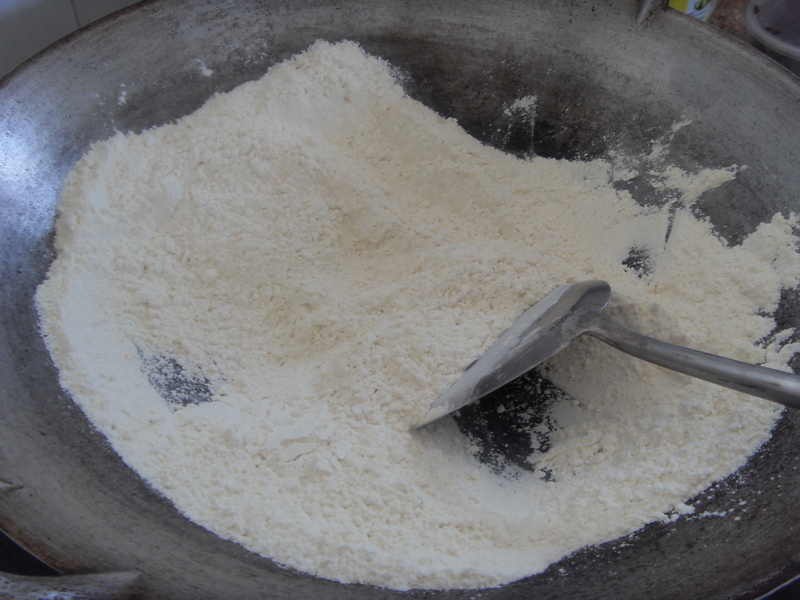 Add in the water and knead till it is a dough but not a hard dough. 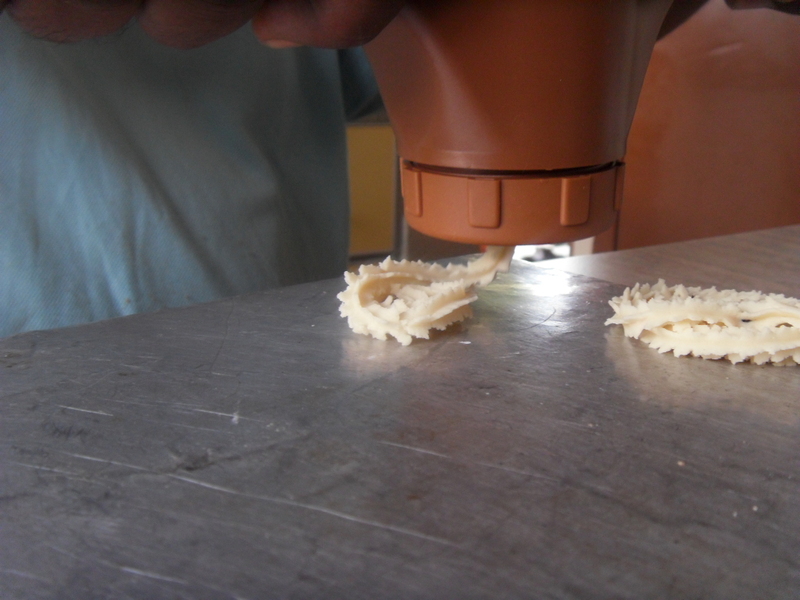 This is not easy to describe but it should be soft enough to press through the Murukku Mould. 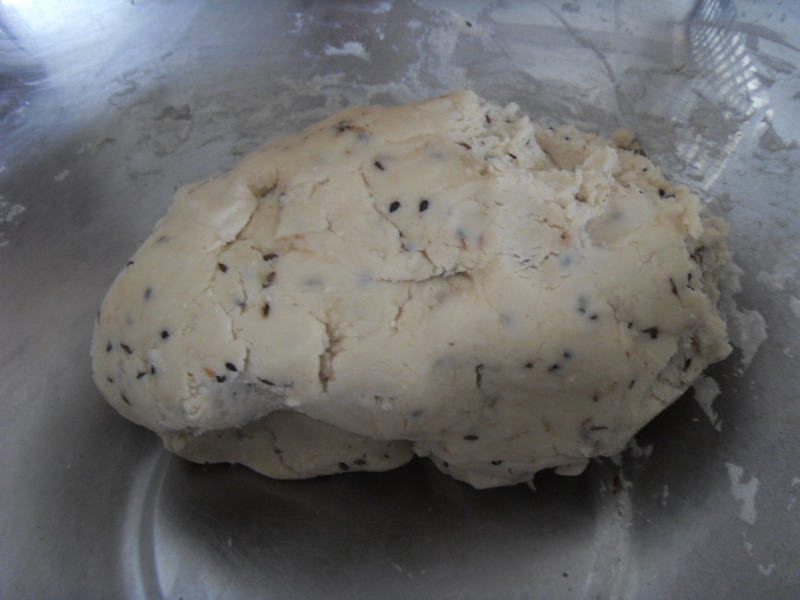 This dough is rather hard as you can see the cracks so add a bit more water and butter. 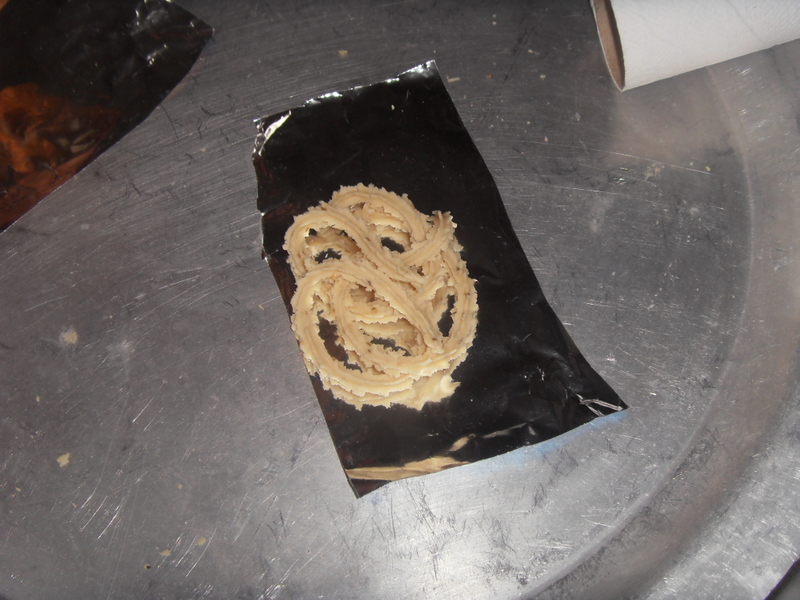 Now fill the Murukku press, do not be smart and fill it too much as it is not easy to press at all. Ask my official presser, my brother who talked too much and regreted because I screamed out for him to help me today. Here are the photos as he pressed them out with all his might. Go round and around, about five times and make sure you do not overlap..
6. Now I think this should have been done before I started the pping bit, heat the oil. 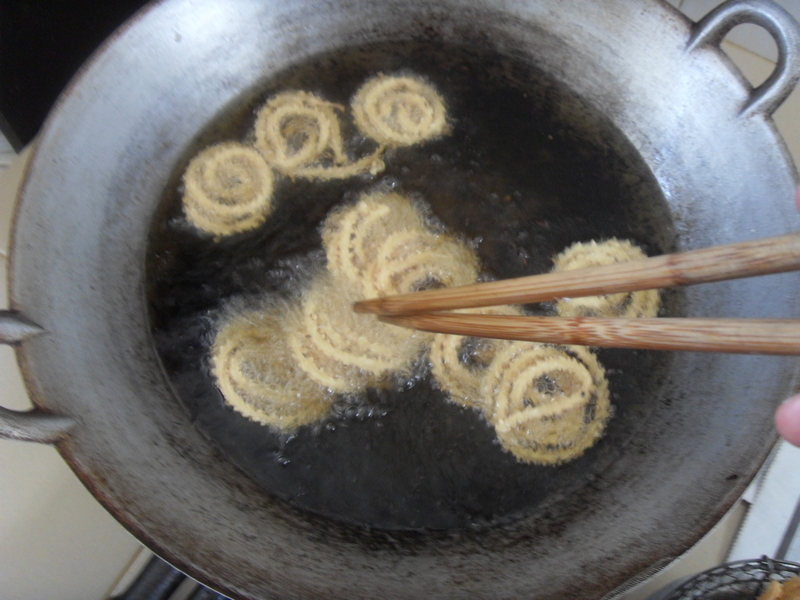 Use new oil as Murukkus are good at absorbing flavors and getting all wrong colored. 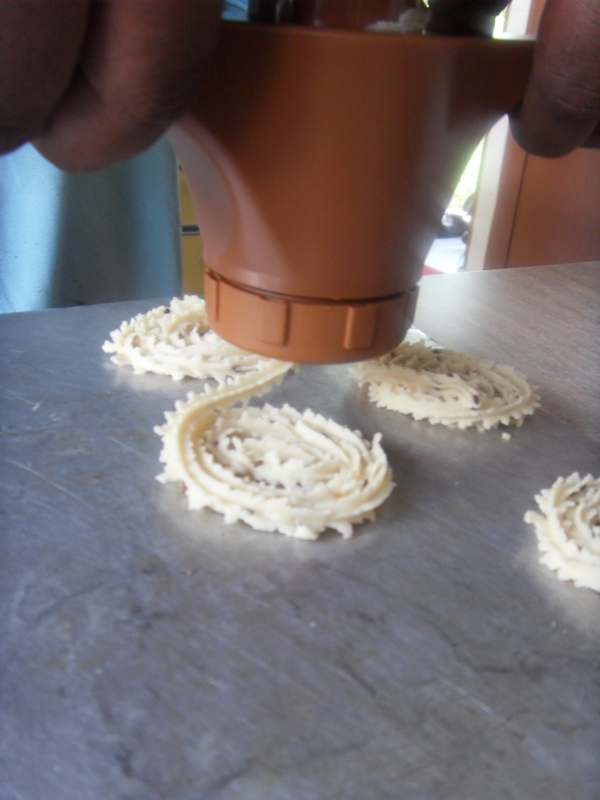 I piped my Murukkus on the back of my cookie trays as I found the method used by my neighbor Sarojini far too tedious. The results were something else. The first lot was all over the place. 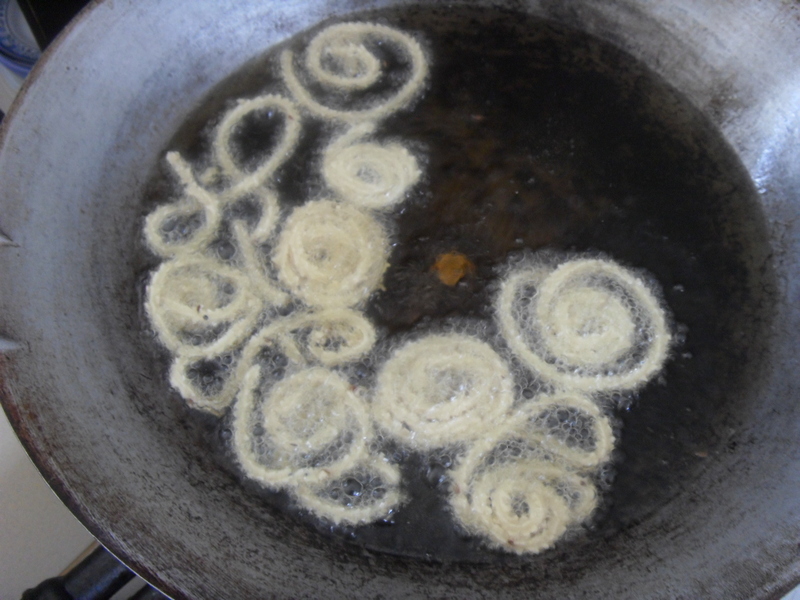 I swear my Murukkus looked like Floating Sanskrit in the oil. 7. 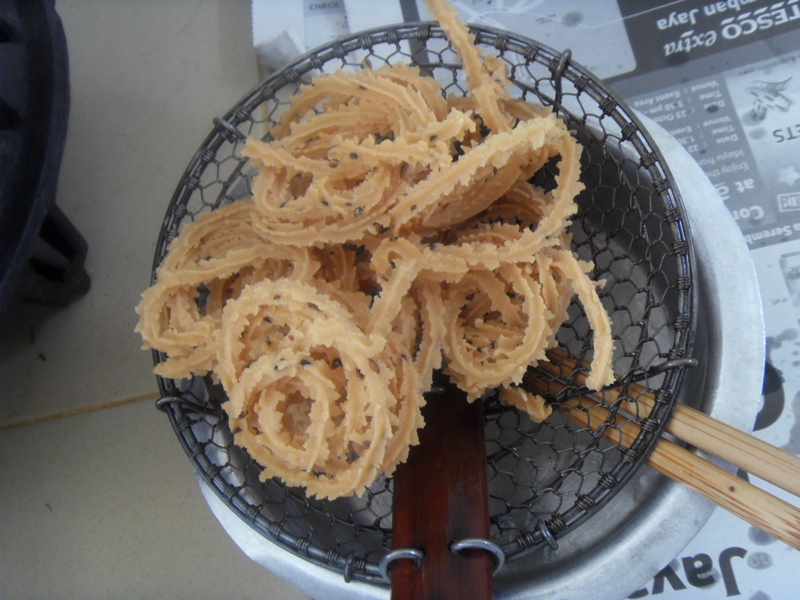 Swirl the Murukku, will I used a large chopstick, always work well with my Chopsticks no matter what I do, so readers please don’t shake your heads. DO NOT leave the Murrukus till it is golden brown as it will have a slight bitter burnt taste. 8. Do you notice the coin in the oil, well as i was told earlier it prevents oiliness, and for some reason, my Murukkus were not oily at all. I was told to use a one sen coin but I could not find any. I do not know what the science of this coin in the oil is but it works. Still do drain the Murukku. 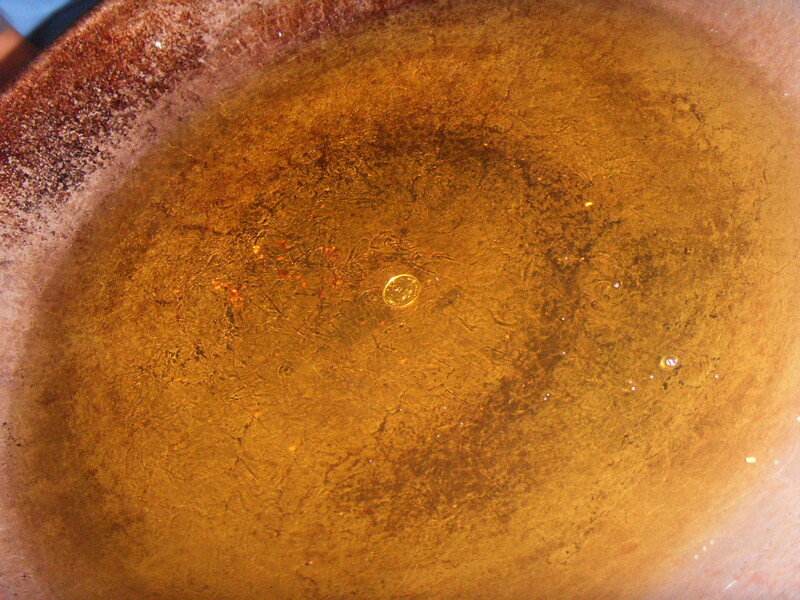 Strain off any oil, but frankly with the coin in the oil and all, there was almost nothing. My fingers were not oily at all. The end…. why because it was all finished before I could get a whole plate of it. Try this recipe, it will surely work, but be prepared for the squeezing, it is a tough tough job. Murukku will be something I will not sell unless I am paid really really well. Happy Diwali everyone. Can you believe it.. this is Crocodile? 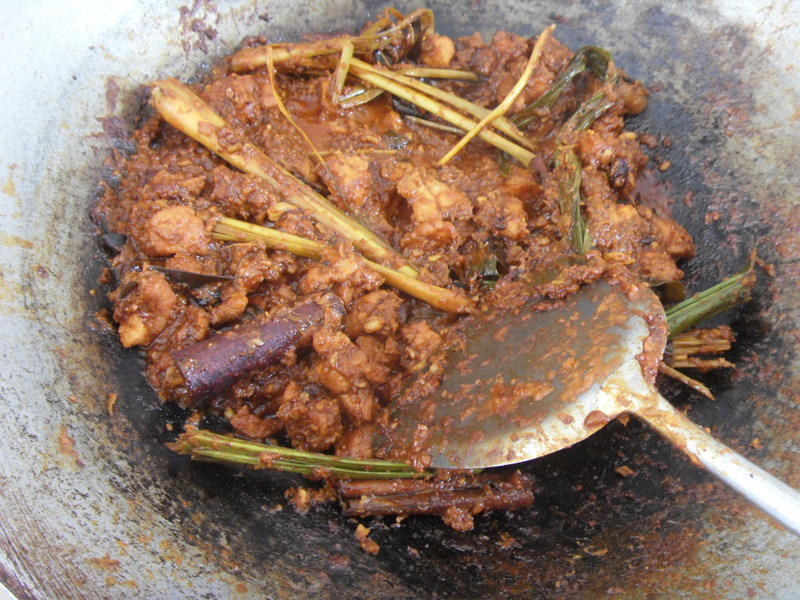 Today I had crocodile meat for the first time and mum made a dried curry or Varuvel, so we had Crocodile Varuvel. My brother brought back two packets two days ago from Sandakan, present from his so called ex. It resembled chicken when I looked at it, because it was frozen, and so mum decided this morning that she was going to cook it. I had no clue what crocodile tasted like, the closest I have eaten anything like that was back in Australia when I had Cream of Alligator soup, but it was just a tiny bit and I thought back then it tasted funny. The alligator flavor was too strong for my liking. I guess back then it was a new meat so people didn’t know how to prepare it. I also remember tasting kangaroo meat back then and it was horrible horrible horrible to the power of a trillion. It has improved nowadays though. So todays endeavour, Crocodile Varuvel. While I did not help to cook it as I was busy preparing for my class and also to prepare the ingredients for my Suji Cake orders for Diwali, so I left mum and Yus do the work. I did make a busy body to check and stir it though. I still felt funny even tasting it because I had this vision of a crocodile in my head and wondered how it was killed. Because surely Mr Croc here did not give himself up! Once I ate Wild Boar and I found pellets, as in tiny bullets in my mouth! So I was skeptical about crocodile. The meat I must say resembled chicken fillets or chicken breast. Anyhow I found the meat to taste and feel much like pieces of pork. Aunty Mary whom we did not tell what meat it was was convinced that it was pork and wondered why we cooked pork at home. She did give us ideas of other dishes to cook as she still did not know nor does anyone want to tell her what meat it was. 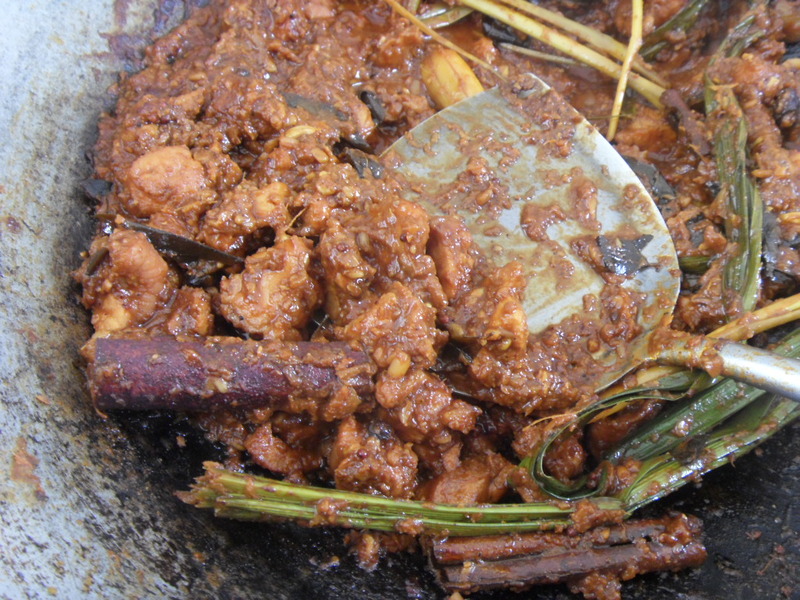 1 kg Crocodile Meat or Fillets – boiled with spices and throw away the water to rid of any gamey smell. Heat oil and sauté spices. Add in curry leaves. It should be nice and fragrant. Add in paste. Add in water if required and then add in boiled crocodile meat. Can you believe that the animal this meat came from could have swallowed you up whole??? 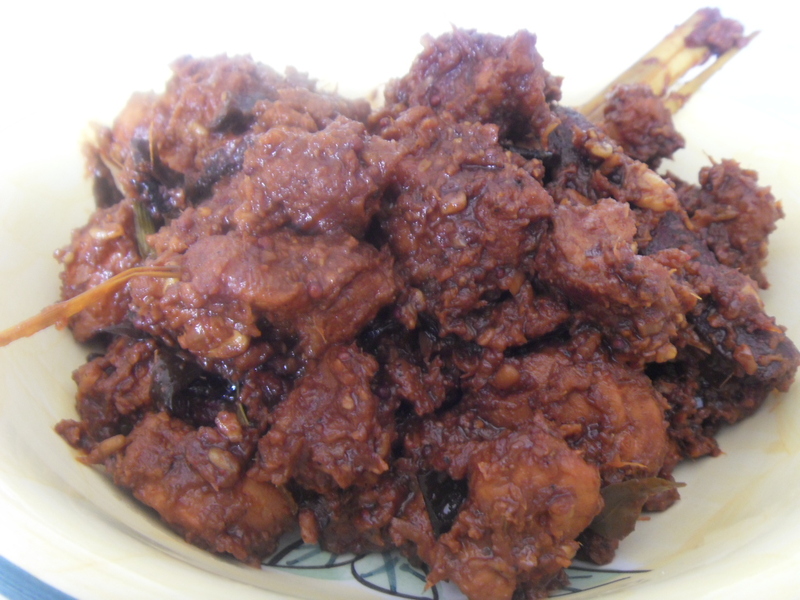 Cook till meat is tender, and then increase heat to dry the gravy. 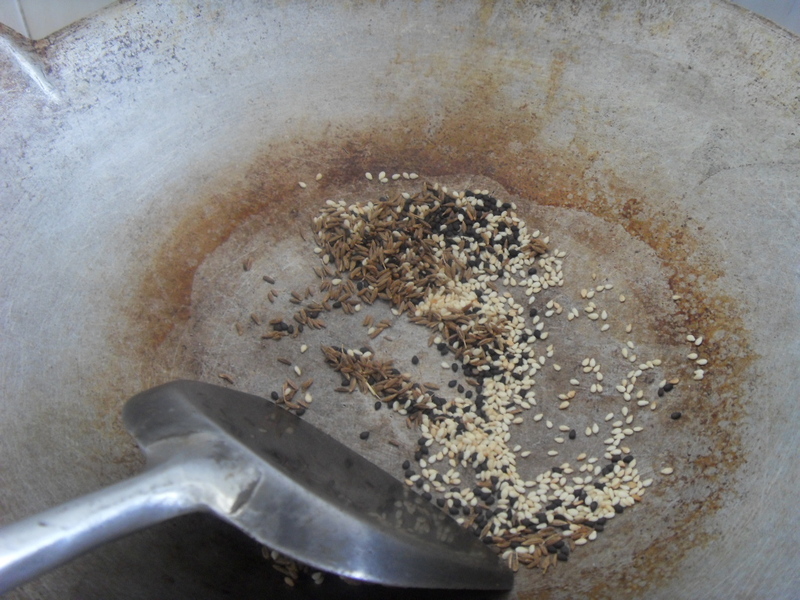 Cook till mixture is thick and dry. If the meat is not tender or still has a gamey smell, cook a little longer. Serve with rice or chappatis.